Requirement: Had a custom List template, and wanted to make it available in create page of all sites of the site collection. Solution: How to deploy SharePoint list template? Create a WSP builder solution to deploy the .stp file to the List template gallery of required site collections! Just create a Feature with the below element.xml file. 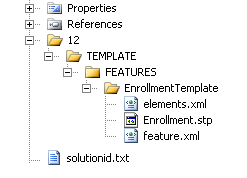 Add the .Stp file to the solution.